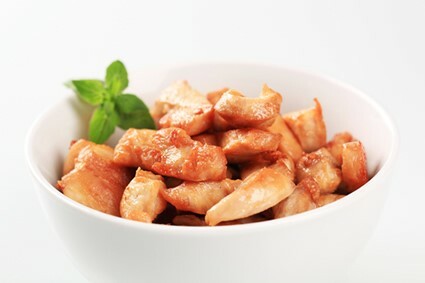 This chicken recipe is quick and easy to make and you can eat the chicken strips as they are or dip in a sauce, pack in your kids’ lunch boxes, put in a wrap, a stir-fry or a salad. the chicken breasts into strips (I use scissors for this as I find it quicker and easier than a knife). Place them on a glass or ceramic baking tray or dish. Season with the garlic, salt, thyme, rosemary and pepper. Bake in the oven at 220 degrees Celsius for 15-20 minutes until cooked through but still tender.